Rosco has a home! 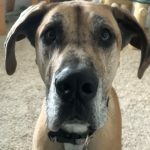 - Rocky Mountain Great Dane Rescue, Inc.
Rosco has a home with his new family in Sandy, UT! Andrea is the Foster Director, and has fostered many dogs over the years. Rosco was one she and Galen couldn’t let go! Rosco will share his home with an 8 year old Dane, Gunnar, whom they adopted from RMGDRI in 2012. Rosco enjoys snuggling with Gunnar, and loves to bring Andrea and Galen his toys when they come home from work. Rosco will get to go to work with Andrea at the doggie daycare where she works sometimes, and will enjoy going for walks around his neighborhood. We are so happy for this sweet boy and his new family!